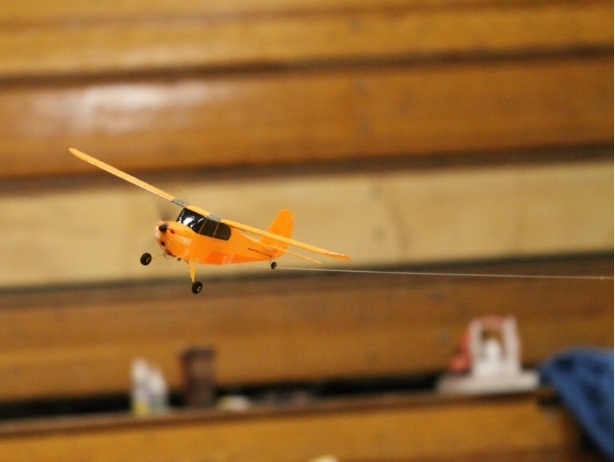 Indoor Glider Towing - Soo Modellers, Canada. Indoor program started last Saturday (18th). Latest indoor pics on website - but have attached original size photos by Peter Smith, above and below if you want to use them on your site. We did lots of glider towing here on the island this summer - and Tom and I were keen to try it in the gym! 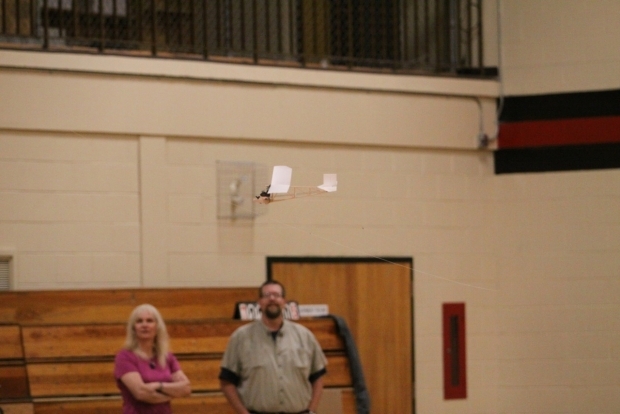 We didn't have a proper glider towhook release - this first trial being a "feasibility" test. 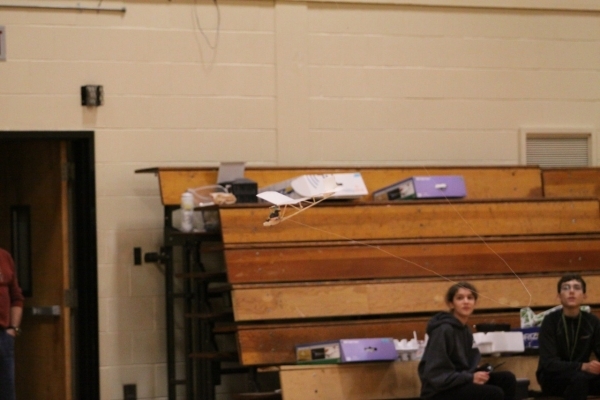 That said... there is barely enough room for a Flyzone Champ to negotiate within the four walls of our gym - but with a glider 'in tow' and swinging to the outside of the turn? I think you get the picture! 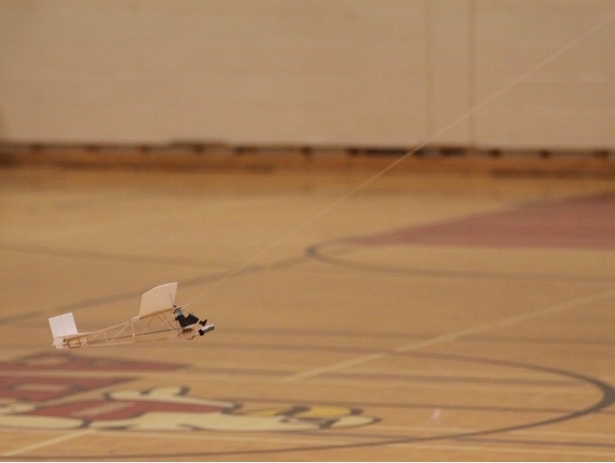 The glider is 'almost' scale Northrup Primary Glider. 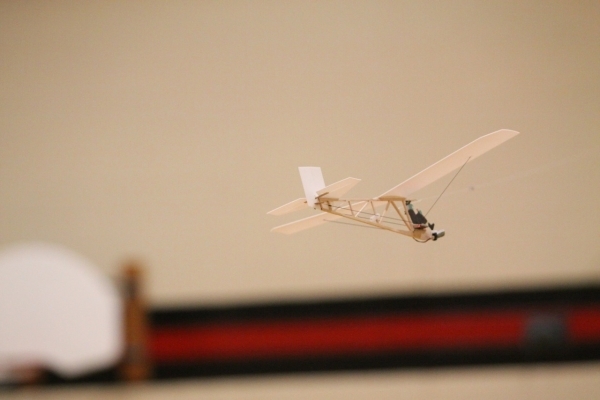 With a stick balsa fuselage and 1mm Depron flying surfaces, it performs quite well on it's own, thank you - without the nasty towline attached! Note the towline "totally out of shape" in the last photo! ... with Wanda a short distance behind! Oh - oh... A slack towline is never a good thing! Happily, Wanda walked away to fly another day - but will use her broom next time, we think!